In this Exodus Crash Strike guide, we'll be going over one of the more complex and challenging Strikes in Destiny 2, as your Fireteam are challenged to take on both the Fallen and the Vex, in a varied Strike on the planet of Nessus. We’ll also tell you how to beat Thaviks, The Depraved Boss of the Destiny 2 Exodus Crash Strike. 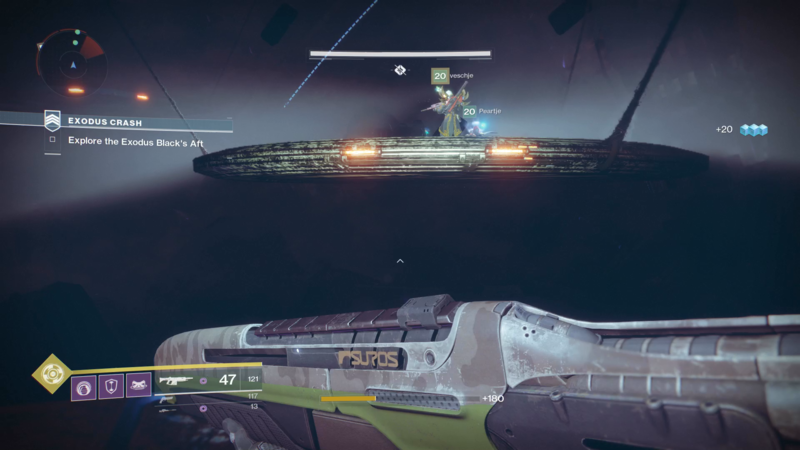 If you like to watch guides rather then read them, we've got a full Destiny 2 Exodus Crash Strike video walkthrough for you right below. 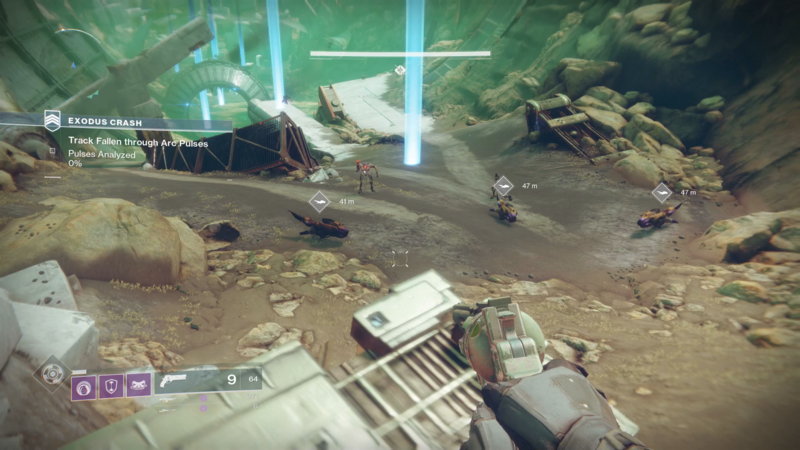 When you're first dropped in to Exodus Crash, for the second Strike that takes place on Nessus, the other being the Inverted Spire, head to the edge of the hill, where you'll see Fallen and Vex fighting it out. Take both sides out, and hop on the Pikes they've left behind. Now, take the pikes the drive through the lights you can see dotted around the map, as you can see in the picture below. After you've tracked the Fallen through the Arc pulses to 100%, you'll have to do this all over again, as you proceed up the path leading up the hill, where you'll encounter Goblins and Minotaurs. Defeat all the Vex you find here, and pass through the now open archway, where you'll find yourself in a winding, large corridor. Come out of the corridor into an open space, and you'll find a group of Overcharged Shanks waiting for you. Take them all out at a distance, and then use Ghost to scan the Fallen Device on the pedestal. Now, you'll have to defend Ghost against waves after waves of Fallen, as well as a few Vex Goblins and Minotaurs. Always make sure to take out the Overcharged Shanks as soon as they appear, as you can't let them get too close to Ghost. 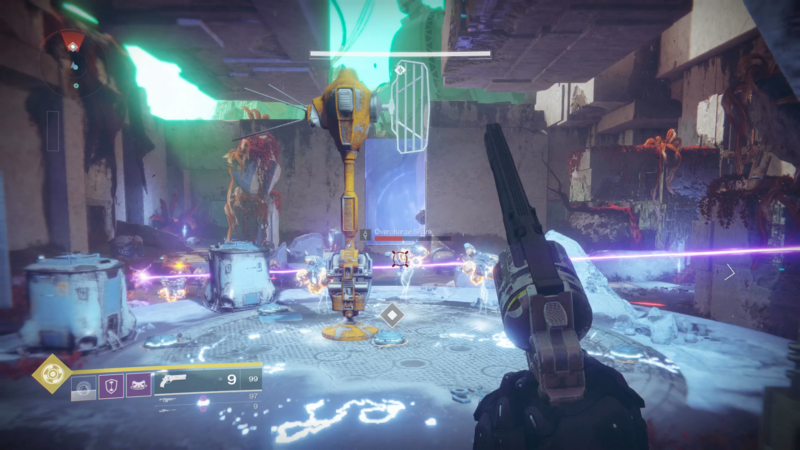 Now that you've successfully held off the assault from the Vex and Fallen, head through the archway that has now opened to you, and you'll find yourself tasked with going through a number of Arc pulses once again. Head to the building structure to the left in the picture just below, and clear out the Fallen, which include a rather tough Captain. You'll also want to take out all the Fallen on Pikes as soon as possible, and take their vehicles to make quick work of the remaining Fallen troops. Split up, and race through all the Arc pulses scattered around the vicinity, and then group back up to head into the next area. 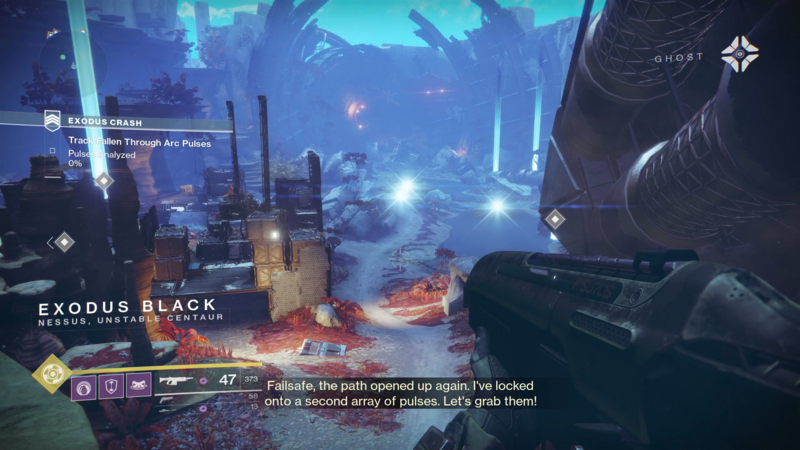 In this next huge area, you'll find Fallen and Vex fighting once again, but before you head into the battle, pick up the abandoned Heavy Pikes that are sitting to the left of the map. Now, take out all the Fallen on Pikes, before turning your attention to the Siege Minotaur laying down fire on the Fallen forces. You can make quick work of this mini boss using the Heavy Pikes, before turning your attention to the Fallen Walker, circling it with your vehicles and laying down fire on its legs. You'll now find yourself in a large, dark room, having to rely on the light from your Ghosts to guide you. This is effectively a platforming section, so jump up the platforms as a group, taking out the few Fallen troops you encounter, until you find yourself facing a tunnel. Quickly vanquish the Fallen that are waiting for you in the tunnel, and proceed through it, preparing yourself to face Thaviks, the Depraved. Before you drop down into the boss arena, take out all the Overcharged Shanks that you can see below. In this arena, you'll want to be sure to defeat all the Overcharged Shanks as soon as they enter the arena from either end, as they can electrocute the floor in certain areas of the arena, effectively making the territory impassable. Thaviks can summon reinforcements from either end of the arena, so make sure to keep an eye on these areas as you're battling the boss, as you don't want any Shanks or Dregs to sneak up on you. 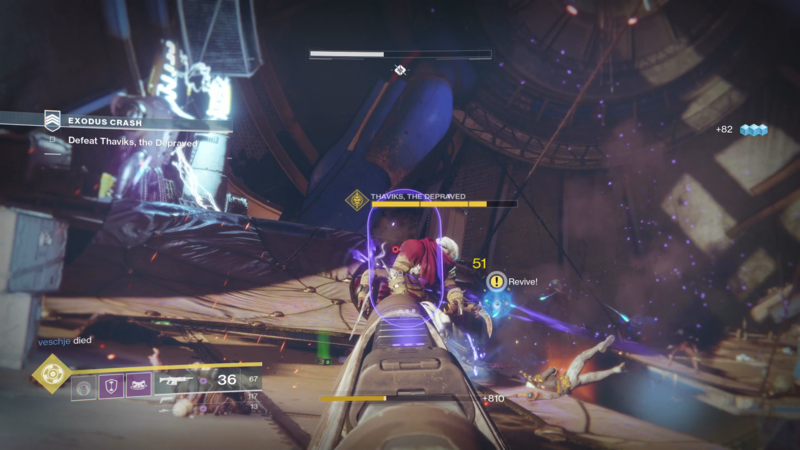 As for fighting Thaviks himself, we'd recommend spreading your Fireteam out slightly around the arena. You don't exactly have to be at opposite ends from one another, but it does help if you're not all bunched together, as Thaviks has some mean melee attacks in his arsenal. As you whittle Thaviks down to roughly half health, he'll start becoming invisible for extended periods of time, and charging your Fireteam with repeated melee attacks. Make sure to keep on the move whenever you can't see him, as this reduces the chance that he'll catch you off guard with a hefty melee attack. Thaviks, the Depraved definitely has a deep health pool, but it's not an insurmountable task to take the boss down, provided that you don't let yourself become overwhelmed by the troops summoned into the arena.